The hanged man understands that his position is a sacrifice that he needed to make in order to progress forward - whether as repentance for past wrongdoings, or a calculated step backward to recalculate his path onward. This time he spends here will not be wasted, he does this as part of his progression forward. His upside down state can also symbolize the feeling of those that walk a spiritual path, for they see the world differently. Where there are others that do not understand the need to sacrifice, you see it differently. This is a natural course of action for you as you walk the path alone. The Hanged Man card reflects a particular need to suspend certain action. As a result, this might indicate a certain period of indecision. This means that certain actions or decisions which need to be properly implemented are likely to be postponed even if there is an urgency to act at this particular moment. In fact, it would be ultimately the best if you are capable of stalling certain actions in order to ensure that you have more time to reflect on making critical decisions, this will ultimately be the best. 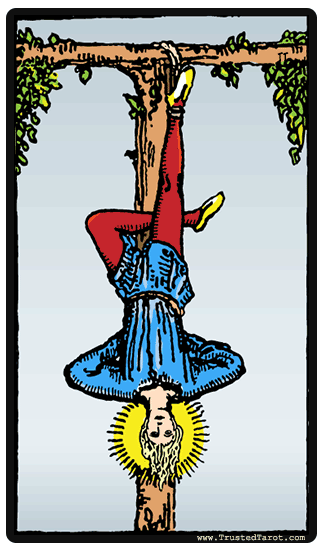 The Hanged Man card reflects a particular need to suspend certain action. As a result, this might indicate a certain period of indecision. The reversal meaning of the Hanged Man card represents a very specific period of time during which you feel as if you are sacrificing a significant amount of time while getting nothing in return. You might have felt as if certain things are at a state of an absolute standstill without any particular resolution or movement. It s as if you are putting your entire effort and attention into something but nothing turns out as it should.